I feel so blessed that we have this inspirational place so near our home, and that we have the opportunity to visit whenever we want. Oh dear, I know it’s been quite a while since I’ve sat down and shared a post with you all. I’m sorry about that. It’s been such a busy summer! I’ll share more about that soon, I promise. 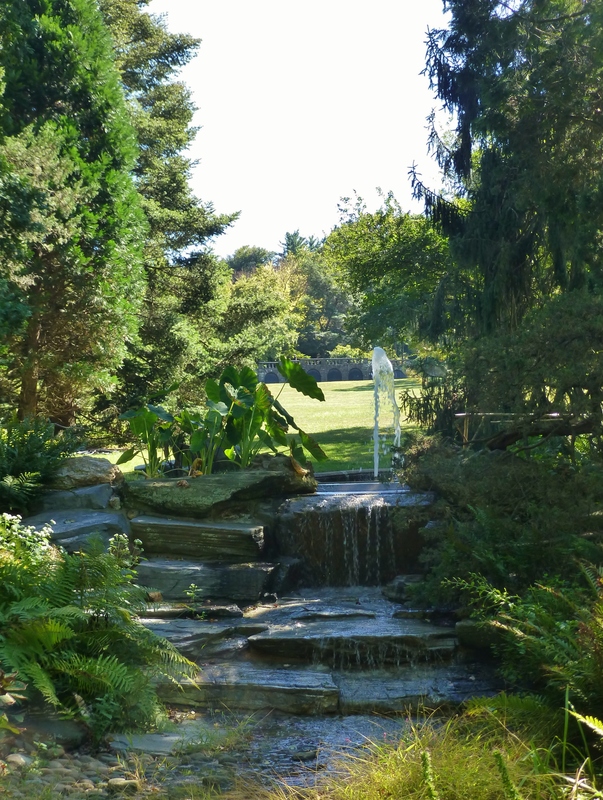 There are many fountains and sculptures in the 92 acres that encompass the Morris Arboretum. Here you see the Key Fountain with the Seven Arches bridge in the distance across the large field of the English Park. This fabulous public garden operates as part of the University of Pennsylvania and is located in the Philadelphia Suburb of Chestnut Hill. It’s truly one of my ‘happy places’. Our family has had a membership at the Arboretum for many years, and we visit fairly often. I feel as if I know nearly every inch of this place from exploring it over such a long period of time and yet it is new and different in every season. 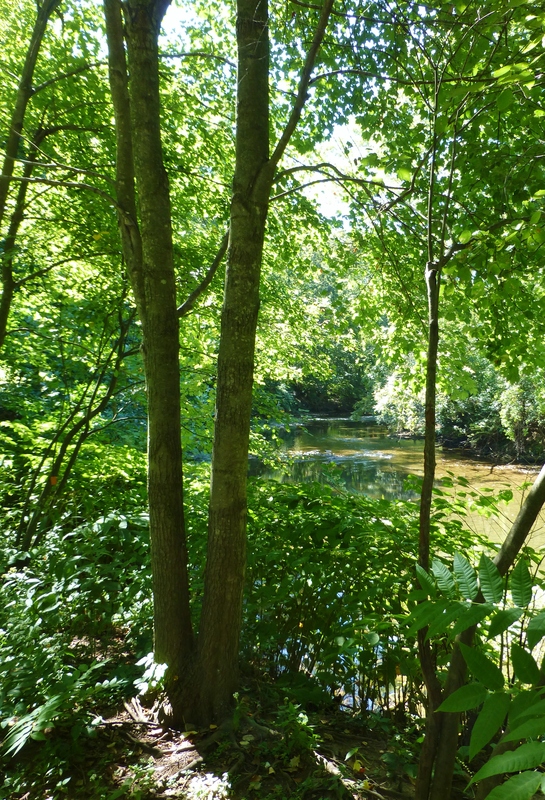 The Wissahickon Creek runs through one corner of the Arboretum, and is a natural habitat for lovely wildlife. It’s so picturesque down by the water. Grady and I had a chance to make a quick fall visit the other day. 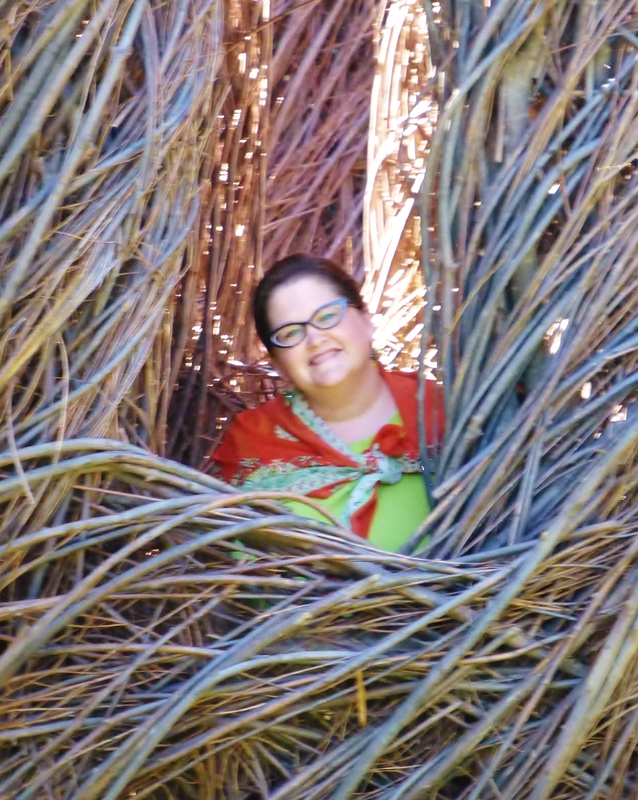 The arboretum has a new exhibit this year: a stickwork sculpture by the artist Patrick Dougherty. We’ve been meaning to check it out for months and finally managed to work it into our schedule–it was totally worth it. 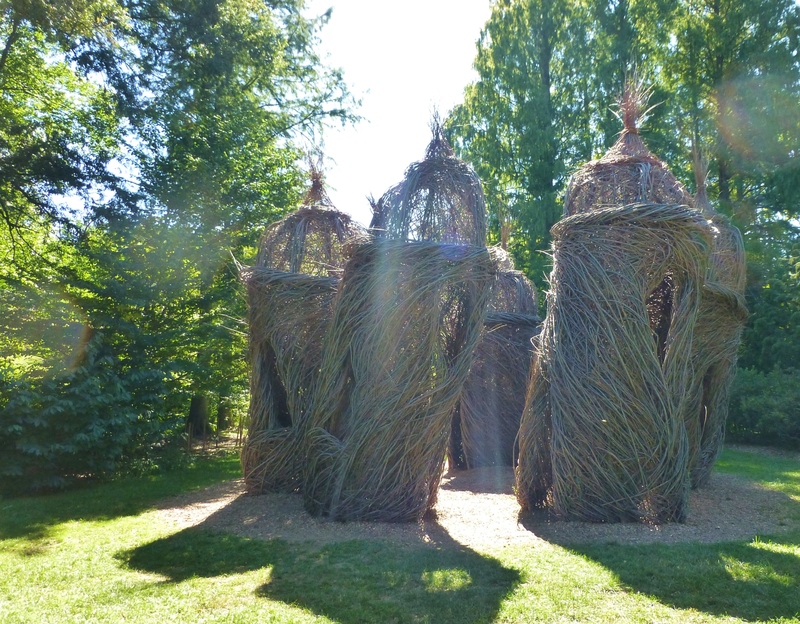 A glimpse of the Willow Sculpture, entitled A Waltz In The Woods, by the world famous artist, Patrick Dougherty. On of the wonderful things about these Willow Sculptures is that they are interactive. 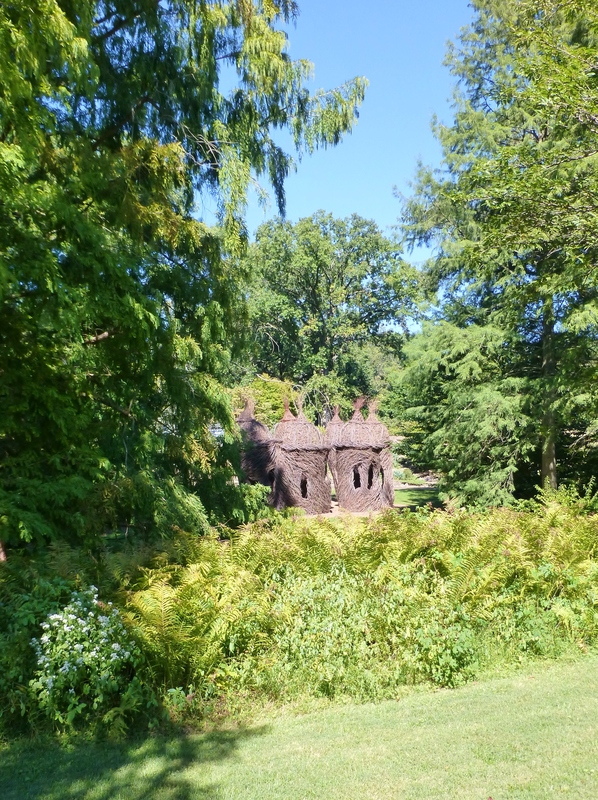 Visitors can go inside the little structures and experience the twigwork intimately. Children seem to particularly enjoy this aspect and much laughter and running about can be observed during a visit to the Dougherty sculpture. I enjoyed popping inside too! The swan pond is always a favorite stop and we were especially lucky during this visit, since it was feeding time. The ducks and swans were both very active and lovely as a result. The Swan Pond at the Morris Arboretum is one of my favorite spots to visit. 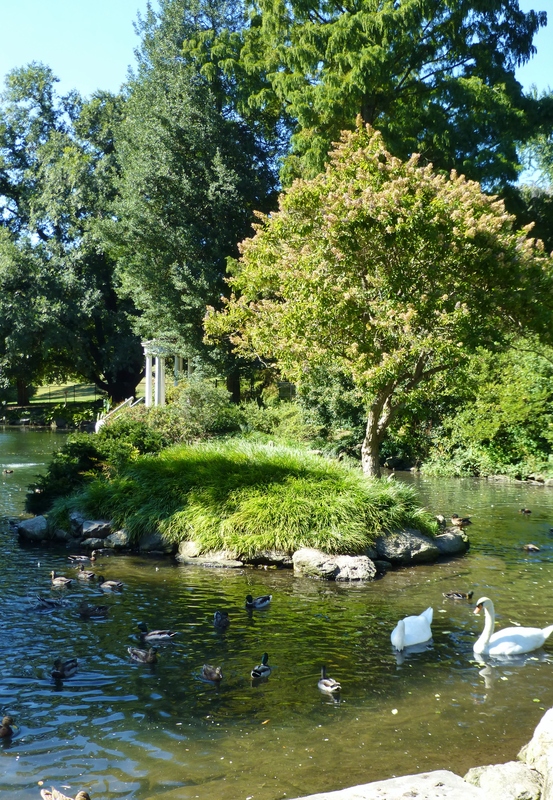 The graceful elegance of the swans is echoed by the Grecian Temple style pavilion. It’s so elegant and peaceful here! Thanks for joining me on our little jaunt to the Morris Arboretum. This place is truly marvelous. I feel so blessed that we have this inspirational place so near our home, and that we have the opportunity to visit whenever we want. Until next time, feel free to share my posts and images on Pinterest and social media. I love making new friends! This entry was posted in Garden, Morris Arboretum, Patrick Dougherty Sculpture, Pennsylvania, Willow Sculpture and tagged A Waltz In The Woods, Arboretum, Chestnut Hill, Philadelphia, Swan Pond, Swans, Twigwork, University of Pennsylvania, Willow, Wissahickon Creek. Bookmark the permalink.